Mother of two, Tabitha Potts is the director of Mimimyne and has worked as a TV researcher for BBC Television Drama, TalkBack Productions and other independent TV production companies. She has also worked as a radio drama producer in BBC Radio Drama as well as co-authoring “Bringing Up Baby: The New Mother’s Handbook“, a light-hearted look at childcare through the ages, with the TV personality and author Daisy Goodwin. 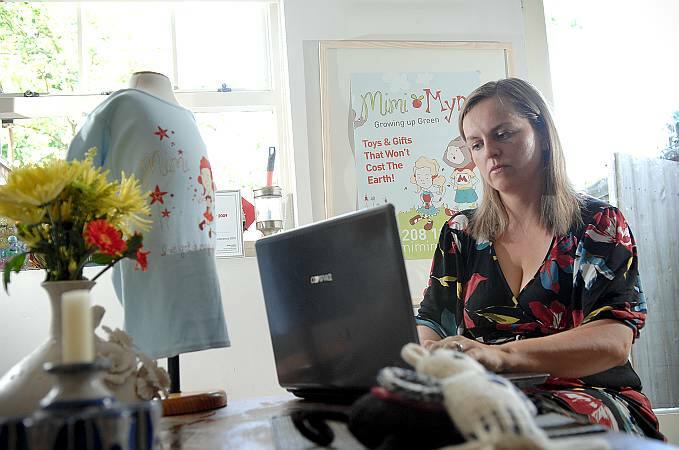 Shortlisted for several awards and having been featured in several publications including Junior Magazine, the Sunday Times and the Express, Mimimyne sells eco-friendly organic baby clothes, funky kids wallpapers, eco gifts and toys and gorgeous kids furniture. Tabitha has been interested in environmental issues for a long time (her parents grew their own vegetables, recycled and composted long before it was fashionable, as well as making their own cheese, bread and elderflower wine!). When she had her two young sons and started looking around for eco-friendly products to buy for them to use and play with, it was her realisation that there were not that many sites around which gave equal importance to great design for kids and the environment that inspired her to start London-based eco store Mimimyne. TP: A future where the environment is nurtured rather than exploited. That means that not only do individuals take responsibility for the way they live, flying less, eating organically or eating less meat, shopping more sustainably and depending less on cars for transport,but that businesses and politicians need to have the will and vision to think big, finding ways for us to travel, live and work more sustainably on a large scale and building the environment into political and corporate decision making. As individuals we can create some change, but we can create more as a group. Putting pressure on corporations and governments is the only way to bring large scale change. Developing countries are very vulnerable to economic exploitation and environmental degradation and a future that does not create more solutions for human beings living in poverty will not be able to save animals, plants, glaciers or rain forests for future generations either. I want to live in a world where economic considerations do not outweigh environmental considerations and where people and businesses are rewarded for creating sustainable and non-polluting, non-toxic products and working alongside nature instead of exploiting its resources. I also want to live in a world where technological ingenuity is not the servant of profit but is put to use in finding solutions for the current very frightening situation we find ourselves in. TP: I think the animal whose plight has most horrified me is the tiger. According to the WWF we have lost 97% of our wild tigers this century. Now that we have almost succeeded in driving tigers to extinction in the wild through hunting, poaching and destroying its habitat through commercial plantations and illegal logging we are about to lose a creature whose grace, power and strength has fascinated poets and artists for centuries. This poem by the poet A D Hope contrasts the ‘authentic roar’ of the ‘jungle tiger’ with the ‘plaintive, savage hunting cry’ of the paper tigers of business and politics. The poem exhorts readers to try and remain true to their ideals even though they might ‘destroy the mortal parts of you’ and ignore the cry of the paper tigers. I think we need to pay less attention to paper tigers and more to jungle tigers. TP: I think you have to try and build the environment into your daily life however you can. Recycle and reuse, shop for sustainably sourced fashion or buy vintage clothes, don’t throw things away but repair, donate and recycle them, grow your own fruit, vegetables or herbs (even on a windowsill), use non-toxic cleaning products, think about sustainability and then ask others to do it too (nicely!). Suggest a recycling policy in your office, sell sustainable products if you run a business (like I do), encourage your school to create a vegetable garden or recycle printer cartridges or used batteries, ask your employer if they could provide a bike rack for employees – little things make a difference and change people’s vision of what’s possible. I don’t pretend to be an eco warrior but I do try to do things in daily life and in my work which help the planet rather than harm it. TP: I’ve often felt ambivalent about politics, as a young person I felt politicians were self serving and didn’t appear to care much about the issues that were important to me and nowadays the things that I get passionate about are community issues (I’m helping campaign for a local adventure playground in my local borough of Tower Hamlets to stay open, for example) and environmental ones. I think that’s why Avaaz and 38 Degrees appeal to me so much, they take that feeling of involvement, the issues that people really care about, and get them listened to globally and the UK, and make changes happen. Join groups like these and find a cause that you care about. Or try and make a change at a local level: I applied for a grant to build a small herb and vegetable garden for a local playgroup, for example, and I see toddlers there every day learning how to grow herbs and vegetables. You don’t have to be a powerful or wealthy person, you just have to have an idea and the commitment to follow it through.